PERUGIA, Italy, Apr 13 2018 (IPS) - The twelfth International Journalism Festival on April 12-15 has drawn 710 speakers from 50 different countries, becoming the biggest journalism festival in Europe. A panel discussion titled “End poverty, protect the planet, ensure prosperity for all? Food is the answer” took place on the opening day in the Sala del Dottorato hall in the center of Perugia, held under the auspices of the Barilla Centre for Food and Nutrition (BCFN). Caracciolo emphasized the deep links between migration flows and food security in the Mediterranean region and how addressing the latter could be part of the solution to the former. Luca di Leo, Head of Communications at BCFN, highlighted the crucial importance of the Sustainable Development Goals (SDGs) set by the UN, shedding light on the clear linkages between the 17 SDGs and food choices. The Director General of IPS Farhana Haque Rahman and IPS Data Analyst Maged Srour participated as panellists. Food systems are facing the enormous challenge of feeding increasingly growing and urbanised populations generally demanding a more environmentally intensive diet, while restoring and preserving ecosystems for the health of the planet. Haque Rahman spoke about the urgent need to enhance the capacity of developing country journalists for them to be able to write analytical commentary to enhance awareness of communities on food sustainability and climate change and influence the food choices of the general public while also drawing attention of decision makers to take the right measure on policies. She highlighted media capacity building and training undertaken by IPS on the SDGs in both developed and developing countries. The IPS Director-General shed light on the importance of giving access to ICTs (Information and Communication Technologies) to poor farmers to enable them to better manage planting and marketing their products. Maged Srour explained the nexus between water and security (the latter in terms of geopolitical security). Srour shared data on water insecurity, specifically in the Mediterranean region, and went on to explain how the increase in variability of water resources also affects the way countries interact. “Most of the water in the MENA (Middle East and North Africa) region is actually shared by two or more nations. So, at the moment we also have climate change hitting this area and consequently an increase in water stress. This obviously increases tensions among those states,” he said. “Climate change, in combination with the increasing population of the world, is definitely a source of instability which could exacerbate migration flows, and could become fertile grounds for extremism and for conflict,” he warned. The Mediterranean region was at the heart of the panel discussions with most of the speakers discussing the nexus of food security, water security, climate change, migration and geopolitical security in the region. Ludovica Principato, a researcher at the Barilla Foundation, presented data and in depth analyses on the Food Sustainability Index, which was developed in collaboration between the BCFN Foundation and the Economist Intelligence Unit, to promote knowledge on food sustainability. The index is a global study that measures facts on nutrition, sustainable agriculture and food waste, collecting data from 34 countries across the world. 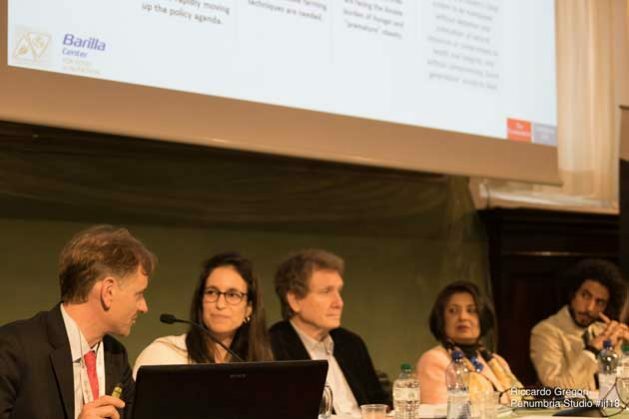 IPS Director General Farhana Haque Rahman spoke about IPS’s work since it was founded in 1964, especially capacity building activities across the world to raise awareness of communities on topics such as food sustainability and climate change. She shed light on the importance of ICTs (Information and Communication Technologies) in the enhancement of sustainable farming and in the overall communication among smallholder farmers to become more productive and consequently climb out of poverty. Laura Garzoli presented an innovative project which won the 2017 BCFN YES! (Young Earth Solutions) award granted by the BCFN Foundation to encourage innovative projects in the field of food sustainability. Garzoli’s project, YES!BAT, “promotes Integrated Pest Management strategy to enhance ecosystem services provided by bats in rice agroecosystems”. Employing bat boxes in rice fields, it encourages insect-eating bats into areas where there are few roosting sites. Food is not the cure all,in fact it adds to the problem! Until these people quit breeding like rabbits it will never get better!Money and food has been thrown at the problem for decades and hunger is more wide spread then it has ever been! Better put the money to family planning and birth control!